Miramichi Paint and Decor (Benjamin Moore) is locally owned and operated by Karen Wheaton since 2005. Karen's passion for colour and design have led her through various career paths including wedding coordination and cake decorating and she has certifications in Interior Decorating and Floral Design. Her natural ability to draw and paint lends to her skill at colour selection and instinctively knowing what colours work naturally together. We manufacture our own resins and exclusive Gennex® colorants, which deliver superior performance and application properties in every product. Paired with our incomparable selection of authentic colors, Benjamin Moore paints are formulated to help you achieve beautiful, lasting results—every time you paint. Custom blinds are also available to order. What are your most searched-for paint colors? Revere pewter (HC-172), shaker beige (HC-45), white dove (OC-17), manchester tan (HC-81), sea haze (2137-50), and linen white (OM-28)—not to mention 232 shades of gray. 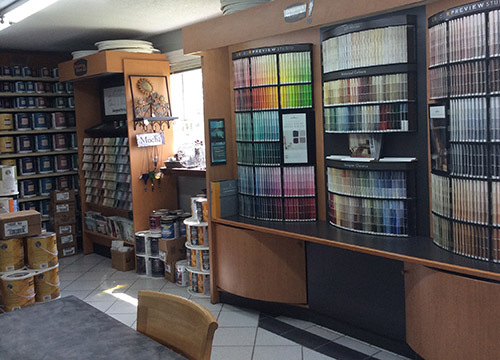 You can see all of our more than 3,000 paint colors by browsing our Color Gallery. Where can I turn for color inspiration? Visit Rooms by Color, an interactive color selection tool on our website that lets you select any room type and color family to see Benjamin Moore paint colors in context. For more color selection tools and inspiration, visit Explore Our Paint Colors. Do you sell environmentally friendly paints?